This is a Pachinko game (Japanese Pinball), a mix of slot machine and pinball. The player has to controll the speed with which many small steel balls are thrown into the pachinko machine. Most of the balls just fall down the machine and disappear, but a few find their way into special holes. This activates a kind of slot machine. Like with slot machines, you win if the same three pictures appear. This is a one button game, because only one button is needed to play it. Press SPACE or click left mouse button to launch balls. Silly slots is a game for silly people. Try and rack up as much money as possible! Special combinations trigger special events. Look out for those! Pizza Slice slamming game with a hot topping twist! Moomoo is dog. You sit in a boat and must to drown dogs. When Moomoo will surface click her and then the dog drowns!.. Don't click on bomb!!! if you has missed 10 dogs, then you has lost. Spin the wheel , good luck ! Find the ball at every level! Raise money in the bank and have fun!? Get the craziest highscore in this fun version of the classic Solitaire Card Game! Test your brain against the clock with this free online concentration memory game. Brain Drain Concentration is based on the popular matching card game "Concentration". If you want to play for real money, nothing is better than a big signup bonus or welcome package to start! 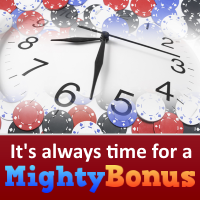 Mighty Bonus lists great bonus offers only from reliable and trustworthy online casinos, bingo rooms, poker rooms. Make The Best Out Of Your Coinless Slot Machine Experience With These Tips! Earning points (Free Slots Website Dollars - FSWD) at Free Slots Website is easy - you'll get 100 points just for registering and other points for submitting comments and game reviews. You will then be able to use points to enter into our contests and win real prizes. Play all the best free online slot machine games at Free Slots Website. Proudly powered by iSlot.